The Columbia College volleyball team may have nine new members, but the whole team has one goal in mind: winning. That is just what they have done in September, starting with Labor Day weekend, winning four out of four games to become the Best Western Classic Champions. The final match of the Best Western Classic was against Lindenwood, 14th in the NAIA rankings. The Cougars won this match: 25-13, 25-17 and 25-22, winning all four of their games in three sets. Four players were voted into the all-classic team, including the MVP of the classic, Cate Eckhardt, the team’s only Canadian. The Cougars started the season ranked sixth in the NAIA rankings; however, after the Best Western Classic they advanced to fourth in the ranks. 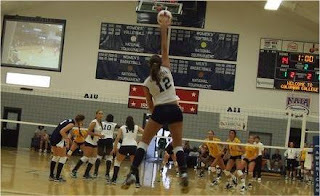 The Cougars had their first conference game against Stephens on their home turf winning the game in three sets. The team then took off to Iowa and brought back the Graceland University Tournament Championship, winning all four of their games. The Cougars are 12-0 as of Sept. 20. “This year’s team is very diverse,” said middle-hitter Maria Omondi. One contributing factor to the diversity is the huge turnover this year. 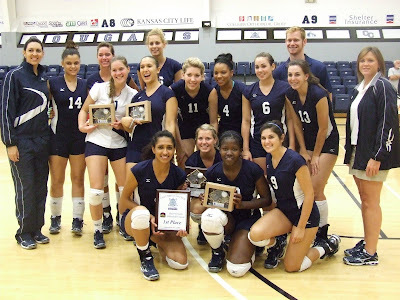 Only four students are returning members of the 2008-2009 Cougar volleyball team. The team consists of six international students, representing four countries as well as seven Missouri students. Replacing nearly the whole team is a huge task and can be tough, but Coach Melinda Wrye-Washington said she does not have a problem with that. “The biggest impact the turnover has had on our team this year has been our level of physical preparedness,” she said.